X-rays and ultrasounds can help identify and diagnose broken bones, foreign objects in the skin and intestines, masses, internal injuries and kidney stones as well as many other pet ailments. Here at Ontario Veterinary Hospital, we have digital x-ray machines and a full time tele-medicine radiologist for the most accurate and timely diagnosis possible. 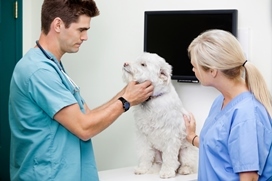 Utilizing ultrasound and radiology as diagnostic tools greatly improves the accuracy of diagnosing certain pet illnesses, including broken bones, traumatic internal injuries, foreign objects and masses. X-rays or radiographs create black and white images of the internal parts of the body, according to the denseness of the part. Bones typically show up white. Internal organs appear in shades of grey and empty areas or areas with very little denseness appear black. If the images need to be enhanced or we need to look at areas that are typically hard to view on an x-ray, your pet can be given barium or certain dyes that easily show up on the x-ray. Certain dyes can be very helpful in diagnosing stomach and intestinal blockages and bloat. To further help us accurately diagnose your pet’s illness, we may take x-rays from multiple angles. The x-ray is a two-dimensional image, which means foreign objects that are close to the skin may look like they are actually inside an organ when the image is taken as a side view. To figure out the exact location, we may also need to take x-rays or perform from the top or bottom of your pet’s body.We even have a board certified radiologist available that can provide accurate consultations on all x-rays and ultrasounds. If your pet is extremely anxious or the x-rays need to be taken from odd angles, we may recommend sedating your pet to make the process smoother and to lower your pet’s level of discomfort. In addition to our other radiology services, we also offer digital dental x-rays, which can help us diagnose oral health problems in your pet, including dental decay, infections, rotten teeth, periodontal and gingivitis. These images can be magnified and enhanced so that our veterinarian can make accurate decisions when it comes to the health of your pet’s teeth and gums. Because the images are digital, they can easily be stored as a file on our computer and pulled up for future consultations and to compare current images with past images. If your pet needs a referral to a specialist or different veterinarian, we can email your pet’s digital x-rays to the new vet. To schedule an appointment with one of our veterinarians, call our Ontario pet hospital at 909-984-2211.